Serious about learning how to draw? Then these drawing tips on copying from other artists might help you step forward. Copying old master's drawings and paintings is a time-tested discipline (especially in the European tradition of art instruction). Many artists, including me, can attest to its value. I remember teaching myself how to draw at age eight by copying my favorite characters from manga books. I copied them avidly for several years while I also doodled to create my own drawings. This experience contributed to a spatial sense that my age counterparts lacked. Later on as an adult, I have copied from numerous artists, such as John Singer Sargent , etc. You can learn to draw Like the old masters; or you can copy contemporary artists' works as well. I recommend that you first start by copying drawings, and then move on to copying paintings! When you copy a drawing by a highly skilled artist, you are not only exposed to his or her drawing techniques, but at the same time you study their thinking process. If the drawings are studies for a finished painting, you can also learn how the artist developed an idea from beginning to end. To reap this benefit, however, you can't just engage in mindless copying. You must consciously ask yourself why the artist did this or that, and why it works. If you can pinpoint specific strategies used in the drawings, then you can transfer these techniques to your own works of art. Copy drawings that have a style you like. If you want to draw like John Singer Sargent, then collect prints of his drawings and paintings and work with them. Don't torture yourself with something you disdain just because everybody says you have to do it. Of course, it is occasionally necessary to learn from someone whose work you do not really appreciate. If you are in an art program, and your teacher assigns you to copy a drawing you dislike, well, grit your teeth and see what you can learn. I have done that, and I have to admit that I always learn something, but it's better it you copy works you admire. Obtain a good clear image of the drawing to work with—whether it is from a book, a museum poster, or a calendar. If you need to make a copy or enlarge the image, take it to a copy shop and get a color copy instead of black and white; it will have better tonality. As for the scale, it needs to be big enough that you can see the details. Usually, if it is within twenty percent of the original size, it should be okay. Copy the drawing from an upright position. If you have easels, position both the image and your drawing surface upright next to each other (both at eye level), so you can see both at the same time. This will help you keep the perspective correct. If you don't have easels, you can use a wall instead. Study up on the artist a bit before you draw. What materials were used for this particular drawing? Remember, though, that you can always opt for a different medium. To save you time and effort, use toned paper to copy an old masters' painting (rather than stark white paper). Most of the reproductions you obtain from books or posters will have a gray—or other neutral tone—background. The toned paper gives you an immediate mid tone, which saves you time when you're drawing. Use washes of tea or coffee. It mimics the type of paper used by old masters like Leonardo da Vinci. After you get the overall drawing down, carefully construct the outlines of the shadows to guide the shading. I usually draw a line dividing the light from the shadow and work from there. I then darken the shadow area to varying degrees. As for the light area, don't forget to look for various shades there too. Watch for soft and hard edges in the lines. Pay attention to the quality of lines and shading patterns. Watch how the shading is done—whether it is hatching, crosshatching, multiple curved lines, etc. Also observe the quality of the lines as they turn in particular directions. The drawing masters will inadvertently exhibit their personality in their lines. 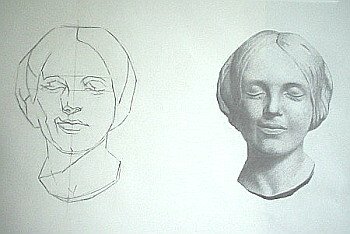 Look for the ways they varied their lines and shading techniques to achieve their purpose. Take your time and enjoy yourself as you copy. How would you handle the same subject if starting from scratch? How is the drawing composed? Is the subject well balanced the subordinate parts? What kind of line drawing technique did the artist adopt? What types of shading techniques are used? What is your favorite part of the drawing? What is most challenging part of copying the drawing? How can you improve? The more targeted questions you can ask of yourself, the more effective the experience becomes, and the more you will learn! Next time when you feel stuck on a particular work, you may be able to draw on the works of other artists and then return to your creation with refreshed eyes. The drawing on this page is a copy of the work of Charles Bargue, a 19th century French academic painter. It took me a few weeks, working several hours a day to finish this one. It was painstaking at first, then tortuous, then joyous at the last. I treated it strictly as a learning experience, and with that approach, I persevered and finished it. I don't expect to do it again for a long while, but it was a worthwhile drawing lesson. It definitely sharpened my eyes for tones. I hope my drawing tips help you get started learning from the masters! Happy drawing! Click here to be a step away from drawing accurately. With great tools, you can speed up your learning curves to becoming a better and more proficient artist. Read my review here.